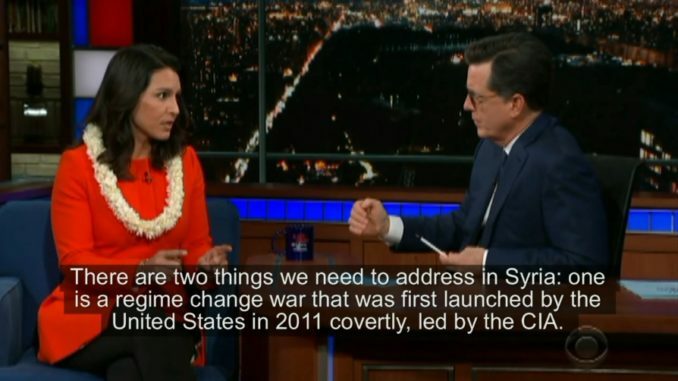 US Democratic presidential candidate Tulsi Gabbard said in a recent television interview with late night show host Stephen Colbert, that the US launched a regime change war against the Syrian government in 2011, which involved the CIA providing weapons, training and equipment to terrorist groups like al-Qaeda and the CIA. Host: What was your motivation to do this, why do you want to be President of the United States? Gabbard: Because as a soldier I know the cost of war, and the most important job that the President has is to be Commander-in-Chief. Host: Umm, do you think the Iraq war was worth it? Host: Do you think that our involvement in Syria has been worth it? Host: Do you believe that ISIS could have been defeated without our involvement and our support of the local troops there? Gabbard: There are two things we need to address in Syria: one is a regime change war that was first launched by the United States in 2011 covertly, led by the CIA. That is a regime change war that has continued over the years, that has increased the suffering of the Syrian people, and strengthened terrorist groups like al-Qaeda and ISIS because the CIA was using American tax-payer dollars to provide arms and training and equipment to these terrorist groups to get them to overthrow the government. Host: But if there is someone like Bashar al-Assad who gases his own people, or who engages in war crimes against his own people, should the United States not be involved? Gabbard: The United States should not be intervening to overthrow these dictators and these regimes that we don’t like, like Assad, like Saddam Hussein, like Gaddafi, and like Kim Jong-un. There are bad people in the world, but history has shown us that every time the Untied States goes in and topples these dictators that we don’t like, trying to act as the world’s police, we end up increasing the suffering of the people in these countries, we end up causing loss of life, both American lives and the lives of people in these countries, we end up undermining our own security, what to speak of the trillions of dollars of tax-payer’s money that is spent on these wars, that we need to be using right here at home.